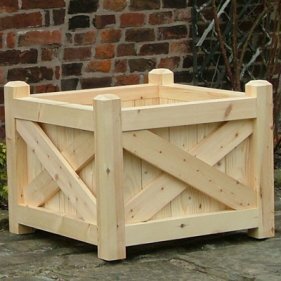 The Whittington is a large impressive wooden planter. It is suitable for a large seasonal planting display, a small tree or shrub or both! It looks particularly good with a really large palm or fern style plant. The Whittington has 75mm square corner posts and cross pieces. 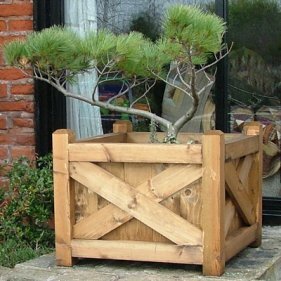 Cross braced and in-filled with 22mm thick planks, it measures 70cmx70cmx55cm tall and is made of Scandinavian red pine. The internal walls of these planters are now painted with a waterproof paint sealant. Under normal garden conditions, where the soil has been improved and fed over the years, alpines and succulents will grow tall and lanky, flower poorly and die prematurely. But where there is low soil fertility and free drainage, they grow strong and stocky, and produce abundant flowers. Here, perennial species, such as aubrietia, candytuft, gentian, pinks (Dianthus) and saxifrage, will live to a ripe old age. In their natural habitat, alpines root in rock crevices or pockets of gritty soil, so in planters most prefer a coarse compost, but one which holds a certain amount of moisture. Succulents, such as lampranthus and sedums, often grow- in little more than rocky debris in the wild. Houseleeks or sempervivums earned their common name because they will even grow when 'planted' between the tiles of a leaking roof. There, spread their tightly packed rosettes to plug the hole. substitute and sharp sand, or grit, to ensure that the plants' roots do not become waterlogged, plus just enough fertiliser to get the plants off to a good start. Alternatively, you can make your own mix of one part topsoil, one part sieved leaf-mould or peat substitute, and one part grit or fine pea shingle. Most alpines are not drought tolerant, but equally they hate water logging. This means that the compost must be kept reasonably damp, particularly during the growing season. For really healthy specimens, give your plants a weak liquid feed as they begin their growing season. Choose a feed with a fertiliser suitable for flowering plants, but avoid one containing a high level or nitrogen, which will encourage straggly growth.